As part of Preservation Week 2015, the State Archives is partnering with the State Library of North Carolina on a Preservation Week Question of the Day – a series of questions related to the preservation of materials both physical and electronic. See the State Library’s blog to see their question of the day posts. What kind of computer can open the files on this 3.5” floppy disk from 1990? Any modern Windows or Mac computer, as long as you buy an external floppy drive. A Windows computer from around 1990 running MS-DOS and having a working floppy drive. A modern Windows computer with special hardware installed inside the computer, plus an external floppy drive, plus special software to emulate a 1990 computer. 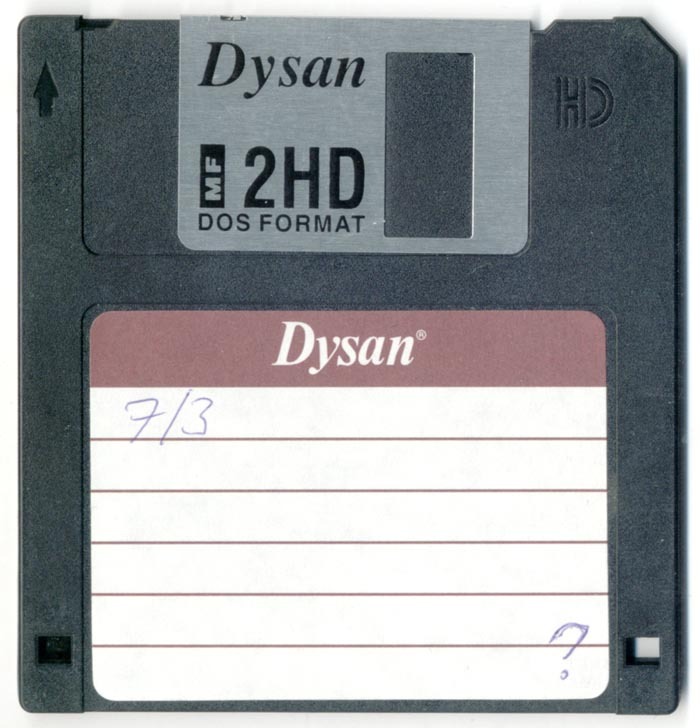 There is no computer that can read the disk, because the insides of the disk have definitely deteriorated too much by now. There’s no way to tell. You can’t be certain about whether the data has survived or what it will take to access the files until you start experimenting with different hardware and software. Do you know the answer? Find out below the cut. 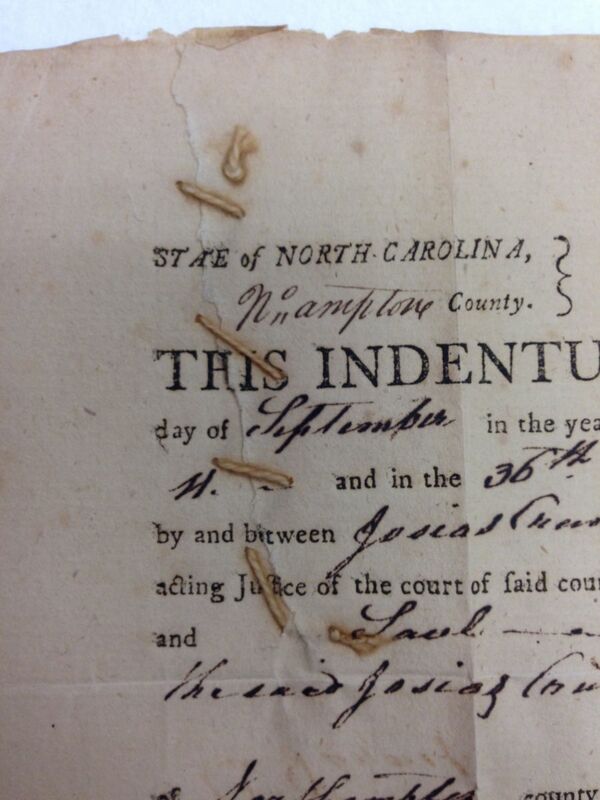 This entry was posted in Preservation and Conservation and tagged Electronic Records, Preservation, Preservation Week, Preservation Week Quiz, State Archives of North Carolina, State Library of North Carolina on May 2, 2015 by Ashley. A whole generation has grown up with their lives recorded in digital form–photos, videos, class assignments, social interactions. For the digital files that are important to last, the creator must actively manage them. Digital files are vulnerable to loss from either human error (failure to be vigilant), natural disaster (hard drive failure or bitrot) or just plain neglect—unstable file formats, poor file naming, or failure to have multiple copies or move a file from a device before replacing that device. Last, when a machine or device saves a file, it typically either assigns it a name or will ask you to name it. If you don’t consciously name it something that will make sense to you now and in the future, you risk losing important files because you cannot remember the name of the file. This is particularly true with digital photos which inherit the name assigned to it by the SIM card. By renaming the file and organizing it according to function or event, you will better be able to discover it in the future. For more guidance on File Naming, please consult our guidance materials, “Best Practices for File Naming” or video tutorials on File Naming at https://www.youtube.com/watch?v=Hi_A4Ywn4VU&feature=youtu.be. This entry was posted in Electronic Records, News, Preservation and Conservation and tagged born digital, Digital Services Section, Electronic Records, file naming, Preservation, Preservation Week on May 2, 2015 by Ashley. True or False: A majority of collecting institutions, more than 80%, do not have a disaster plan in place that can executed by trained staff. This entry was posted in Preservation and Conservation and tagged disaster preparedness, disaster recovery, Preservation, Preservation Week, Preservation Week Quiz on May 1, 2015 by Ashley. When records have been damaged by water, it is very important to begin the recovery process as soon as possible. However, do not go in and start pulling records. Below are some initial steps that need to be taken prior to initialize the recovery of wet records. Do not enter the affected area or building until it has been determined that it is safe to do so. In a water emergency, potential dangers to people include electrical shock and exposure to sewage, chemicals and mold. If confidential records have been damaged, recovery will need to take place under proper security conditions. If the water source is not determined, assume the water is contaminated and protective clothing must be worn. If sewage or other dangerous substances contaminate the water, enlist professional assistance. Do not enter an area with standing water until the electricity has been turned off. Once safe access is available, assessing and stabilizing the area immediately is necessary. The greatest damage to records happen during the first 8 hours. Within 48 hours, paper will begin to breakdown and to show initial stages of mold. Photographic and magnetic/electronic media will breakdown sooner. If recovery is beyond your capability to handle due to severity, size, staffing, and/ or resources, contact vendors and specialists immediately. Quantities too large to stabilize within the first 48 hours should be frozen either for defrosting and air drying at a later date, or for referral to a commercial drying vendor or preservation professional. Documentation of every step of the recovery process needs to be done. Be sure to keep a complete inventory of all records that are moved. All records should be eventually removed from the damaged area, even if the records are not wet. They have been in an area that once did, or may still have high humidity level which can promote mold growth. The inventory needs to include: type of record, record description, record format, original location, extent of damage, new recovery location, and any other tracking/ recovery identification. Initial response flow chart – click on the image to see a larger version. For more information on disaster mitigation, preparation and recovery, please feel free to contact Jennifer Blomberg, Head of Collections Management Branch at the State Archives of North Carolina at (919) 807-7308 or at jennifer.blomberg@ncdcr.gov. 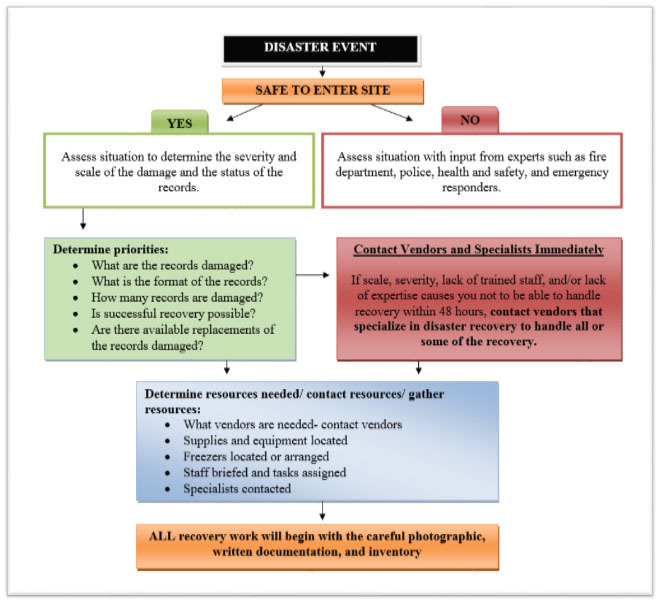 This entry was posted in News, Preservation and Conservation and tagged Collections Management Branch, disaster recovery, Preservation, Preservation Week on May 1, 2015 by Ashley. Digital Preservation for Individuals and Small Groups Webinar Viewing is TODAY! Please join the Government and Heritage Library and State Archives today for the online viewing of Digital Preservation for Individuals and Small Groups led by the Library of Congress’s Mike Ashenfelder. This webinar will be a great introduction for individuals and representatives from small organizations who have interest in preserving their own digital photos, documents, recordings, videos, and other digital files. As technology changes, the greatest threat to preserving digital files is obsolescence. Files may get stuck on obsolete media or in some form that may become unusable in time. If you don’t actively care for your digital possessions you may lose access to them. This webinar can help increase your understanding of what it takes to preserve commonly used digital files such photos, recordings, videos and documents. Learn about the nature of the digital-preservation challenge and hear about some simple, practical tips and tools to help you preserve your digital stuff. Mike Ashenfelder, Digital Preservation Project Coordinator, has worked at the Library of Congress since 2003 in the National Digital Information Infrastructure and Preservation Program. He writes about personal digital archiving, leaders in digital preservation and issues and new developments in digital preservation. He also produces public information videos and podcasts. Before joining the Library of Congress, he worked for a decade in the Bay Area as a technical writer. This entry was posted in Events, News, Preservation and Conservation and tagged Collections Management Branch, Electronic Records, events, Preservation Week, webinars on April 30, 2015 by Ashley. True or False: Paper quality is affected by the materials it is produced from. This entry was posted in Preservation and Conservation and tagged Preservation, Preservation Week, Preservation Week Quiz on April 29, 2015 by Ashley. How would you fix a torn piece of paper without tape? One way might be to take another, smaller piece of paper and glue it on top of the tear. This actually forms the basis of modern conservation repair work, though Conservators take great care when choosing both the paper and adhesive. The repair paper is usually an extremely thin tissue with long fibers and excellent aging properties, while the adhesive will be non-staining and easily reversible even with age. Another way would be to sew the tear back together. This is seen more commonly with parchment as it tends to be sturdier and less likely to tear further from the stitches. 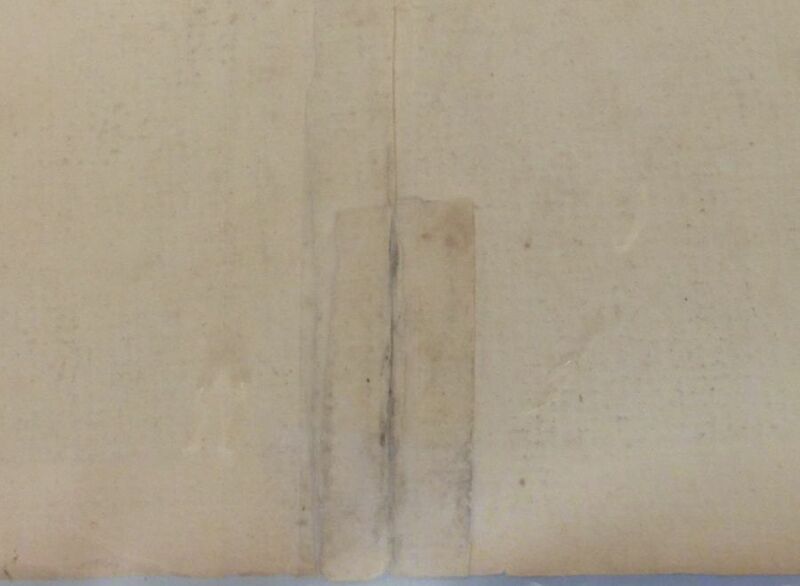 However, if the paper is good quality and in good condition, it can be sewn as well, as seen in this example from the Northampton County Apprentice Bonds. If a historic repair is still working and functioning properly, I will frequently leave it intact. However, if it is damaging the paper, either because it has caused a new breaking point or was done using harmful materials, I may remove it and replace it with a more conservationally sound repair. 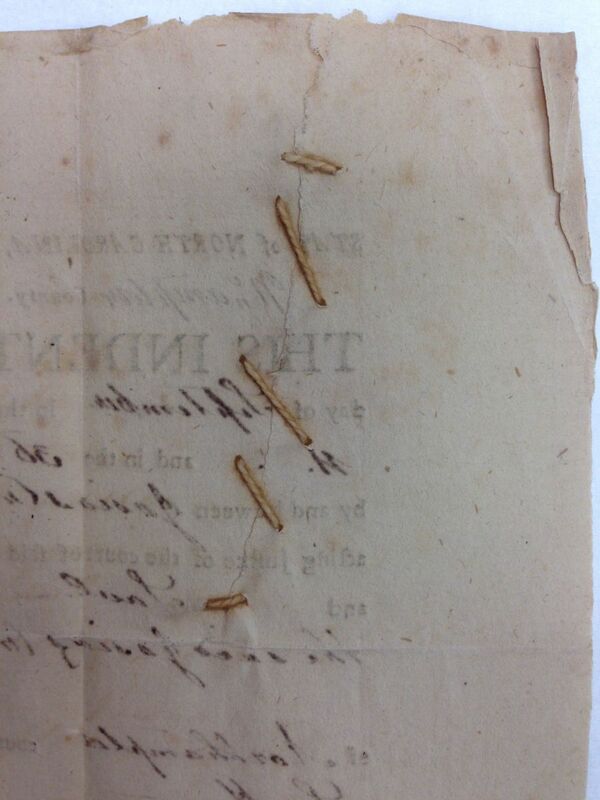 In the case of this Apprentice Bond, both the paper and repair were in good condition, so the sewing was left intact. This entry was posted in News, Preservation and Conservation and tagged Collections Management Branch, conservation, County Records, Preservation Week on April 29, 2015 by Ashley.